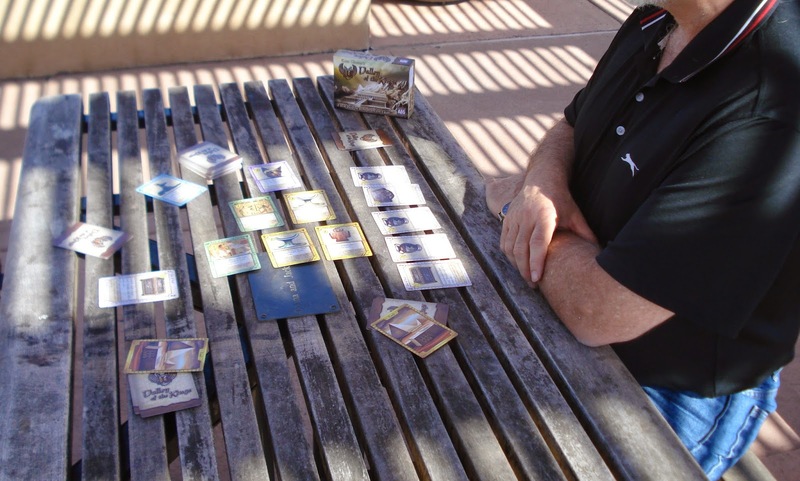 Valley of the Kings is the perfect deck building card game to take with you on a trip. It fits in a small box and doesn’t take up too much room on the table. The game play will keep players engaged from start to finish. Valley of the Kings starts like most deck building games. Players begin the game with a tomb card and 10 Start cards of which there are 4 different types each type having a special ability. Players deal themselves 5 cards from their start deck and immediately bump into one of the unique elements of the game. In the center of the play area are 6 face-up cards arranged in a pyramid with 3 cards forming the base, then 2 cards forming the 2nd tier and then 1 card as the top tier. Players can only buy cards from the bottom level of 3 cards. The remaining cards from the upper tiers now tumble down to refill the empty spaces below them. The top of the pyramid is refilled from a central draw deck at the end of a player’s turn. On their turn players may use all 5 cards in their hand. Each card has a gold value, a purchase cost, and a special ability. Players can play each card for only one purpose: a) use the gold value to purchase a card from the pyramid, b) use its special ability, or c) place the card under the player’s tomb card entombing it. The need to entomb cards is another unique element to the game. A player’s tomb is the only avenue for accumulating victory points. When a card is entombed it is taken out of play from the player’s deck and can no longer be used. So, how long should a player hang onto a powerful card to use versus entombing it for victory points? The game ends when all cards in the draw deck and the pyramid are acquired. Only those cards in each player’s tomb are scored to determine the game winner. Any entombed Start cards are each worth 1 victory point. Unique Artifact cards have a specified victory point value ranging from 2 to 5. In addition, there are 5 types of card sets that yield points based on the number of different cards in the set a player has entombed. The set types are Sarcophagi, Canopic Jars, Amulets, Books, and Statues. Valley of the Kings provides for plenty of opportunity to mess with your opponents and interesting decisions on each round. Which card to buy, how to tumble the pyramid, which card to entomb, and when to entomb really powerful cards that you want in your deck to use. 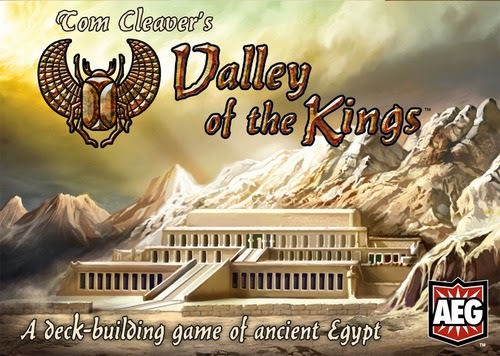 We have an open copy of Valley of the Kings available in our Demo Games Library for you come in and try.